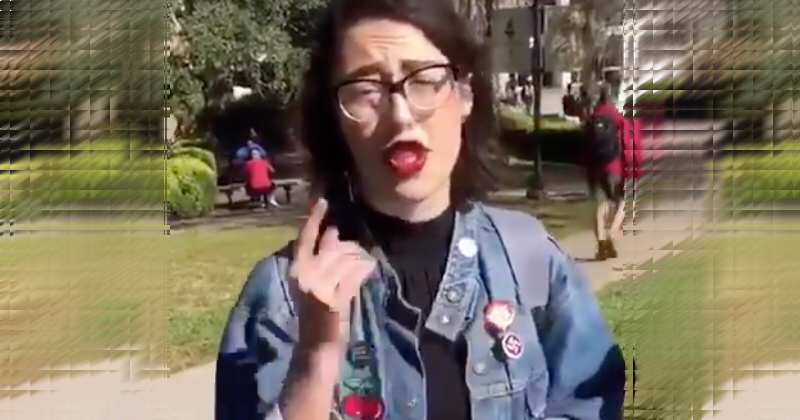 An intern for Andrew Gillum, the Florida Democratic candidate, was arrested and charged with battery after throwing chocolate milk on a group of College Republicans at Florida State Universities Tallahassee campus. The far-left student activist, Shelby Shoup, is listed as an intern for the Andrew Gillum for Florida Governor Campaign on LinkedIn and is a member of FSU Students for Justice in Palestine. The profile states Shoup has worked on the campaign for nearly two years, conducting “extensive donor research for Tallahassee, Florida, and national supporters,” as well as helping coordinate fundraisers, receptions and formal events. Shoup also claims to have held informal Twitter question-and-answer sessions. Part of the exchange with the College Republicans was caught on camera. Shoup said, “F*** you. I will,” before she laced him with chocolate milk. As she was walking away, she kicked a DeSantis sign out of the ground. FSU released a statement via twitter identifying their expectations that each member of the community embrace the values of civility and ethical conduct and obey the law. Regarding Tuesday’s incident, the individual was identified, arrested and charged with battery. Just like any other liberal, she can dish it out but can’t take it. Shoup attacks the right for having their own beliefs and is upset because she was arrested for attacking them. True millennial. She now wants money for legal and counseling fees. So, because Shoup was arrested, the liberals are calling the GOP Party “the GOP Nazi Party.” Imagine how it would go down if the Republican Party did this to the Democrats? This would be on every network for weeks. Ah, the spoiled generation. Parents who fail to exert authority ‘raise’ youngsters with no respect for anyone. Children of the spoiled generation are used to having their demands met by their parents and others in authority, and that in turn makes them unprepared for the realities of adult life. This has consequences, from the classroom to the workplace, the streets, to the criminal courts, and rehabilitation clinics. Being spoiled is classless - from aristocracy to underclass, children are now spoiled in ways that go way beyond materialism. This is partly the result of an inability to distinguish between being authoritative versus authoritarian, leaving concepts such as authority and boundaries blurred. The consequences are measurable - highest rates of child depression, child-on-child murder, underage pregnancy, obesity, violent and antisocial, and pre-teen alcoholism. Young children's’ inflated sense of their own importance is fuelling the obesity epidemic. Children feel they have the right to demand foods which would once have been given as an occasional treat. Some children thought to have attention deficit hyperactivity disorder might simply have never learned how to behave or to show respect. There should be a presumption both in law and in policy that adults "know better'' and are in the right unless there are exceptional reasons. Teachers' authority has been vastly weakened legally, professionally and culturally. Fathers should have more access to their children following separation or divorce. 'Separated fathers must be legally recognized as being of paramount importance. Children no longer have boundaries. Some parents, due to a lack of time and pressures at work, are trying to buy their children's love, which is toxic. They feel guilty for not being around as often so when their children ask for things they simply say "yes" to compensate. Long working hours have taken a toll on families. As a result, parents cannot invest the time in their kids that they should. With the parents out to work all the time the children are turning to their peer groups to provide them with the family they need. Parents should be taking greater responsibility for their children. Teachers and other figures in authority should be able to exercise their powers when parameters are broken. How ironic, the people that show no respect for anyone are the ones who demand it the most. This has become an epidemic, and we see the clear effects with today’s liberal society.